The black or red caterpillars feed on a plant of the genus Aristolochia species, whose members are commonly known as birthwort, pipevine or Dutchman’s pipe, hence the name Pipevine Swallowtail. Feeding on this vine makes them them poisonous as both larvae and adults. The adults feed on the nectar of a variety of flowers. 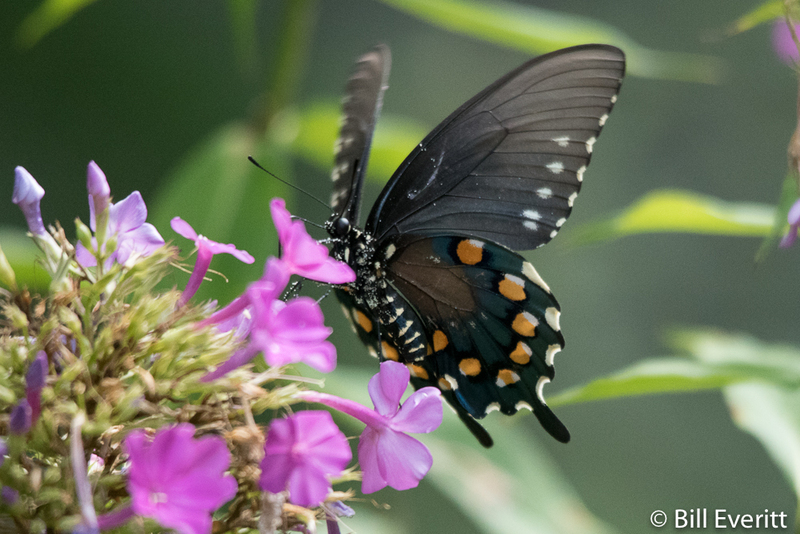 The Pipevine Swallowtail is mimicked by many species, including the dark morph female Eastern Tiger Swallowtail, the Spicebush Swallowtail, and the Black Swallowtail. Shown below are a Pipevine Swallowtail (left) and a female dark morph Eastern Tiger Swallowtail (right). We’ve planted a pipevine, specifically the Dutchman’s Pipe, just to attract the Pipevine Swallowtail. And it’s paid off. Every year we watch as the Pipevine Swallowtail lays her eggs and then follow the development of the caterpillars as they chew their way through the leaves of the vine, finally morphing into the butterfly. The video below shows a Pipevine Swallowtail laying her eggs.